And so we’ve reached the end of SXSWedu 2014. Fittingly enough, it was 35 degrees and raining when I touched down in Austin on Sunday, and it was 65 and sunny on Thursday when I went wheels up back to Chicago. Yeah, it’s been that kind of winter. But enough about weather. 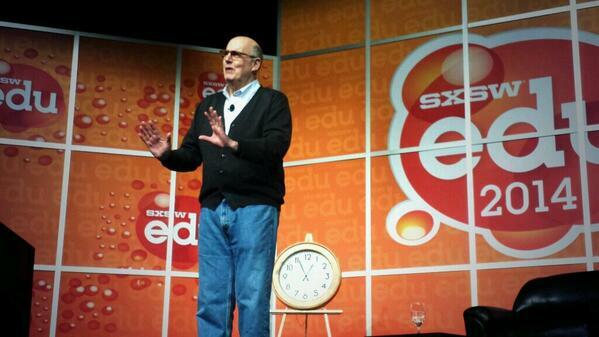 The final day of SXSWedu began with a few morning sessions and ended with a keynote by Arrested Development star Jeffrey Tambor – you know him as George Bluth (there’s always money in the banana stand!). 1. Rob Scordino gave a short and enjoyable presentation about history in education. Rob was super droll (in a hilarious way) and also super knowledgable. I got a good vibe from him. One of his major points was that the way we teach history REALLY needs to change in education, because the classic learning/memorization of facts and dates has become pretty useless when we can look up anything at any moment. So with technology increasing constructivist learning and the access to content, it’s FAR easier to focus on critical thinking and analysis in the history classroom. So let’s do it, Rob says. Here, here. Click to embiggen and read the slide! 2. Most interesting thing learned today? In Rob’s research he’s found that there’s NO correlation between teacher age and amount of technology integration. In fact, younger teachers currently integrate technology LESS than older teachers. Fascinating, right? 3. One more thing about Rob – he wants to work as a curator at a museum. So if you happen to manage a museum, are looking for a curator, AND are one of the nine people reading this blog post – I throw my full weight behind Rob. 4. I attended a panel discussion called, “When Does ‘EdTech’ Simply Become Education‘” featuring three people not in education. And THAT last fact was super important to a LOT of people in the crowd. At the end of the session the panel fielded questions, and if the panel discussion was a cartoon the members would’ve been pelted with tomatoes. I’ve never quite understood how “ask the panel a question” translates into “soapbox for three minutes, get the crowd riled up, and not ask a question.” Whatever. I thought the panel made some great points (see my Twitter screenshots below point #5), and I enjoyed the discussion. I’ll blame conference fatigue for the restless audience members. 6. Jeffrey Tambor’s keynote was more emotional than I expected. The guy REALLY respects teachers – and it’s obvious he wasn’t faking it. Just super genuine. He used to be a teacher, too – and he cried the day his kids got library cards. Gotta respect that. Books and teachers saved Jeffrey’s life growing up, he said, and I believe him. He also dropped a few F-bombs (what scandal!) and was self-deprecatingly hysterical. 7. Surprisingly enough, on the way out, a teacher was complaining about Jeffrey’s keynote to her coworker. She said she wanted more “practical” advice and wondered why Jeffrey was chosen as the final keynote. Uh, because he was inspiring and awesome? And he used to BE a teacher? Seriously, if you want your KEYNOTE speaker to dole out lesson plan resources and list off iPad apps you can immediately use with your students, I would recommend a different conference. 8. 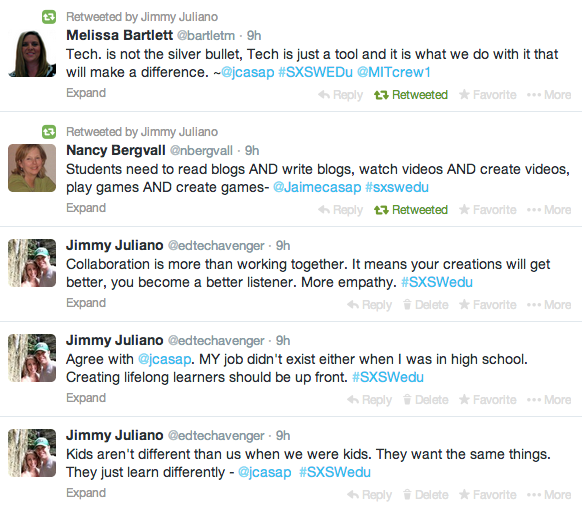 Final thoughts: SXSWedu was amazing. I met some awesome people and I’m excited to take resources and ideas back to my colleagues. If you ever get the chance to attend SXSWedu, jump at it. Seriously. It’s worth it just to be in the same room with so many innovative people. The energy is palpable everywhere you go. Every conversation I had was memorable. Heck, I shared a cab with an attendee on the way to the Austin airport and HE was an awesome guy. The entire experience was super inspiring, and it makes me want to be better at what I do. Oh, and Jack Andraka followed me on Twitter. I’ve arrived! Hope to see you next year, South By! 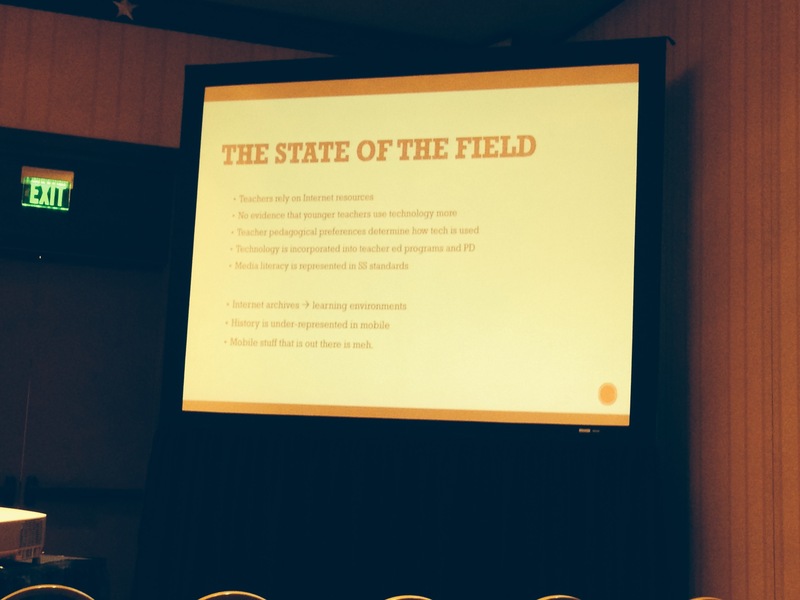 Previous Post SXSWedu Day 3 Recap! Next Post Illinois Reading Conference!